Marty and Chris Merritt exchanged E-mails during March – August 2011 while I was encouraging Marty to draw maps of the various rides. Marty and I would meet at my table along the Venice Boardwalk where I attempted, with little luck, to sell copies of my Venice history book. The 288 page book was the only one to include a short history of POP, 26 pages of photos and text. 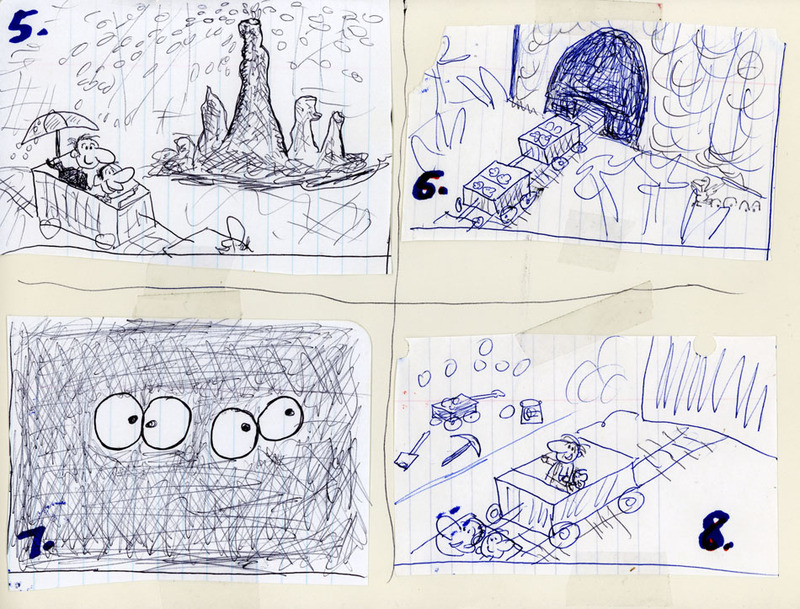 I would try to prod Marty’s memory offering tidbits of what I knew about the ride interiors. Marty had vivid memories of some, while others were quite painful to complete. The hope was that Chris would include at least some of them in his book, but alas Chris decided that it would be too expensive to redraw them. So the maps are offered in this Web article. I'd love to see the concept art you have! As for POP not always following through with some of the rides, when Disneyland opened many of the theme rides were also done very cheaply. The original Snow White ride, Alice in Wonderland, Mr.Toad and the Flight to the Moon were all rather dumb and cheap when Disneyland opened. I always thought that if POP had continued and did well, that they would make better theme rides or update them as they have at Disneyland. Jeff says you did a book on Knotts Berry Farm? I also went there since I was a tiny kid 60 years ago! I also collect some Knotts Berry Farm junk...When I was little, much of KBF was also very cheap and mostly some old wood shack buildings with some old stuff. Now you wouldn't think it was the same place anymore! Most of the old farm has been replaced with thrill rides. Yes, One of the not well known things about Disneyland is that as soon as it closes every night there is a big army of maintenance workers, painters and janitors who come out and fix everything. Everything is gone over and cleaned and fixed every night. When I was at POP, there was only the one auto mechanic and his helper who tinkered with all the broken rides and a guy who tinkered with the trains at Mystery Island. There was usually no maintenance or even cleaning . The boss would have us clean around our own ride when we were not too busy. After so many years of pay one price with kids going on the rides over and over things naturally began to deteriorate. I think that when the park first opened there were many more workers and janitors and stuff, but as the crowds and big bucks began to dry up that they spent less and less on keeping things up and just milked it for as much as they could get. Some of these rides needed very special parts and specialized workers. Not everyone is going to know how to fix the hydraulics on a diving bell, or fix the swinging arm on a giant blue genie or make a flying saucer bounce up and down! I think that Disneyland must spend a large part of their costs on maintenance and cleaning. When the diving bell needed a new hydraulic part that cost $50 grand, the boss at POP just closed the diving bell . If the hydraulics on Dumbo broke and it cost 50 grand then Disneyland wouldn't think twice and would have it fixed in a day or two! 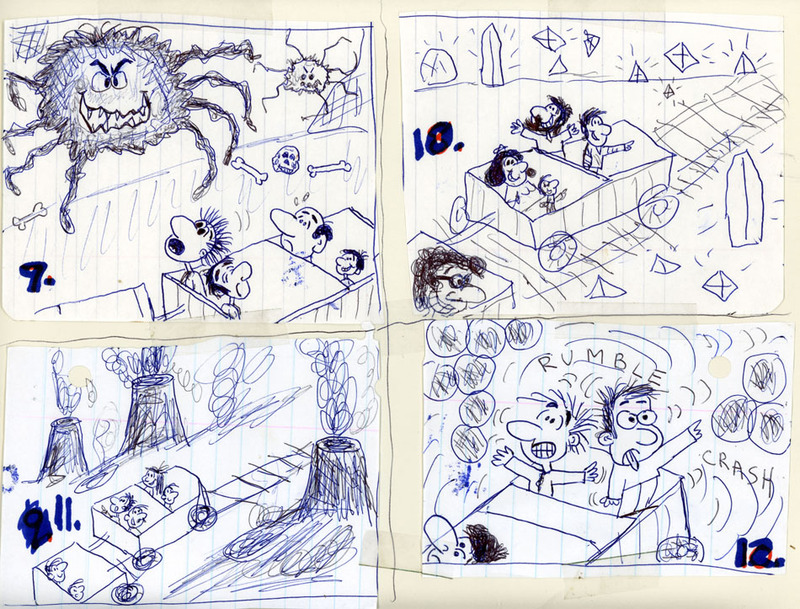 The interesting things about these rides is that the majority of the concept art for them that I've found is so good! Just as good, if not better than the concept art for Disneyland. It seems that in some cases (not all mind you) the execution just wasn't there - and then when things started needing maintenance, it fell apart rather quickly. so keep your hands unside the train at all times. out of coconuts, you don't wnat to know what he throws! 3) Look out above, a canibal is inviting us for dinner, and we're the main course! 4) Don't be in the stew, there's a cannibal village. They seem to be asleep so be very quiet. They're probably full from having the last train load of passengers over for dinner. Cannibals love their fellow man, with butter and ketchup on top! 5) We're really in hot water now. The heat from the volcanic mountain makes gysers. This is Old Unfaithful. It can go off at any time and spray us with boiling water. Uh oh, it looks like its starting now! Sorry if you get wet! 9) A giant poisonous spider. One bite and you're dead! 10) The heat from the volcano makes diamonds and crystals worth millions! 11) This is the center of the volcanic mountain. If it errupts now, we'll be burnt to cinders. We won't go to waste though, because the caniibals love barbeque! ocean. Maybe we can get through if we go very slow. 14) We made it. Its down hill now. Oh no, the brakes are gone. Hold on, we may fly off the track! 15) Let's hope the suspension bridge will hold us! 16) We've come out of th mountain back to the jungle at night. There's a tropical storm. Don't get hit by lightning. 17) We're coming back to the station. Hope everyone has made it! Thanks again for all these Marty - really great stuff. O.K. I'll tell you about the Deepest Deep and a little about the other theme rides along the midway. Before that I should mention that we also went to Disneyland the first month it opened. Thinking back now it seems that many of the POP rides were copied from Disneyland rides, or vice versa? The 76 cars were the same as the Disneyland cars except the POP cars had no center guide rail and ran over the ocean. The Ocean Skyway was the same as Disney's Skyway mover except POPs went way up over the ocean! The Flight to Mars was similar to Disney's Flight to the Moon (long gone),but POPs was much, much better when it opened. The Deepest Deep was a very cheap version of the Disney Submarine ride. You got into a silly little sub looking car and you were pushed up and down by hydraulics to make you feel you were bouncing in the ocean. The simulated ocean was done very cheaply as were all the theme rides along the midway. Poor cutouts and silly looking stuffed fish. These rides were mostly only fun for very little kids and after going on them once or twice there was little reason to go on again. When the hydraulics failed and it was closed, we older kids didn't care. Near the Deepest Deep was Around the World in 80 Turns. It was a bad version of Disney's Small World. You got on a car and were taken on a journey to Europe and there were also bad cutouts and dolls. It was a bit hard on the neck and back as Jeff mentioned in his book because you would look at one scene for a second and then the car would jerk around to have you face another scene. The Flying Dutchman had standard cars and track. It was a very cheaply done Pirates of the Caribbean. There were cutout pirates and a few stuffed ones and you banged into doors that opened to pirates and a skeleton or two and treasure. It was barely scary like the old Sleeping Beauty and Mr.Toad rides at the original Disneyland. The best part of the Dutchman was when you went upstairs a door banged open and you were outside the ride for a second and you could see the people outside and they could watch you. People outside saw you and then they wanted to go on too. Then you made a quick turn and you went back inside. I 'm not sure, but it may have predated Pirates of the Caribbean? I already mentioned the Safari ride also on the midway walk. It was also on a standard track and cheaply made and strictly for the tiny tots. The Squid ride was near the Mr. Dolphin and was a thrill ride that mostly just spun around and you thought you were going to hit the other cars. It was O.K. the 1st time but was boring after a minute or so since it just kept spinning the same way. It could go pretty fast though and you could get dizzy. The Flight to Mars and the Flying Carpet must have cost a few bucks. 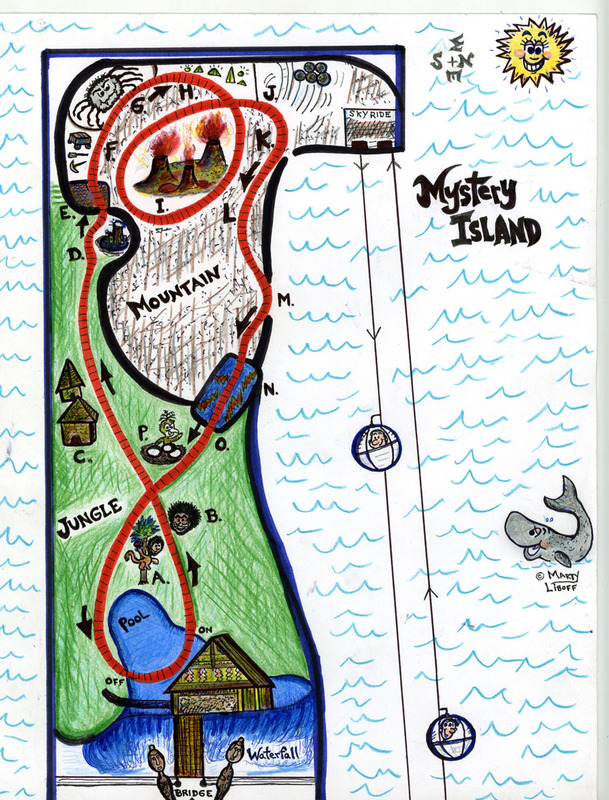 Mystery Island must have cost a fortune to make and was the largest ride along with the roller coaster, however the Flight to Mars and Magic Carpet were also very well done. Also on the midway was Davy Jones Locker that was also very cool when it opened. Davy Jones Locker was the old Toonerville funhouse in Ocean Park that was revamped into a sea theme. Jeff misspelled Toonerville in his book . From the Toonerville Trolly comics I assume? There is a very quick glance of Toonerville in Spencer Tracy's movie, Dante’s Inferno. I gave Jeff a copy recently. In front there was an old rolling barrel that is also in an old movie with Fred Astaire and in Jeff's book (see page 168 and 174). I don't think you could have a fun house like this anymore because of liability problems. 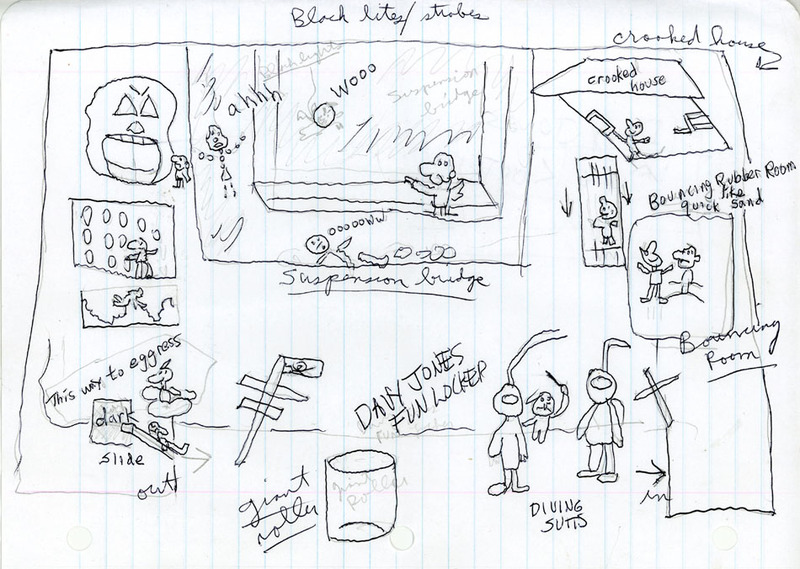 You entered past some hanging old dummies in diving suits and walked through a meandering maze . There was a bouncy room with a soft rubbery floor that was great fun to bounce on, but old people and fat people had a tough time on! There was an exit right there for people unable to take it! Then there was a crooked room where everything was sideways including a chair and table. There was a dark pontoon type bridge with glowing monsters and blacklights you had to go over. At the end there was a cute sign that said this was to the egress with a bird and eggs. It was the exit. You walked into a tiny dark room and the next thing you knew you were on a slide sliding outside! This could be very dangerous because you actually fell onto the slide and was very scary the first time when you didn't expect it. Jeff says this egress ploy was an old gag from other older parks. The Flight to Mars was wonderful when it first opened. 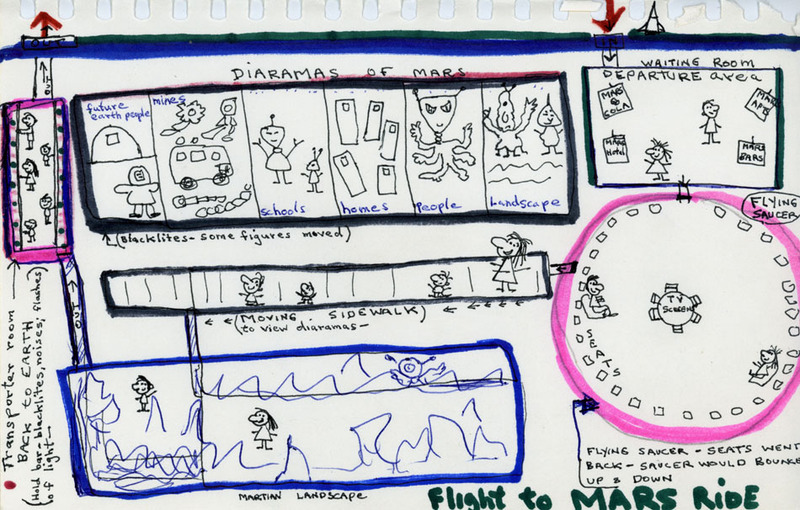 You entered into a flight boarding room with drawings and ads for your trip to Mars. Then you were led into a round flying saucer spaceship (Jeff page 252). It was also hydraulic and bounced you up and down while you watched TV screens of your flight. Then you were led out onto a moving sidewalk where you saw life on Mars with glowing eyed Martians, a typical American home on Mars and some of the mining going on there. Then there was a display of Mars and a Mars house. To get back to Earth you entered a narrow room with mirrors. You were told to hold onto a bar and look into the mirrors and you would be transported back to Earth. If you let go of the bar or turned away you were told that your atoms might get lost in space! Black lights flashed and strobes and then the back door would open and you were back outside at POP ! I think this may have predated Star Trek and their transporter room? Unfortunately as time went on everything was broken down inside and it became a poor shambles of a once great theme ride. The Magic Carpet was a nice ride for the whole family. It wasn't real scary and usually went fairly slow but was done very well. Originally they had a big man in a turban that made him look huge standing outside ushering you in. 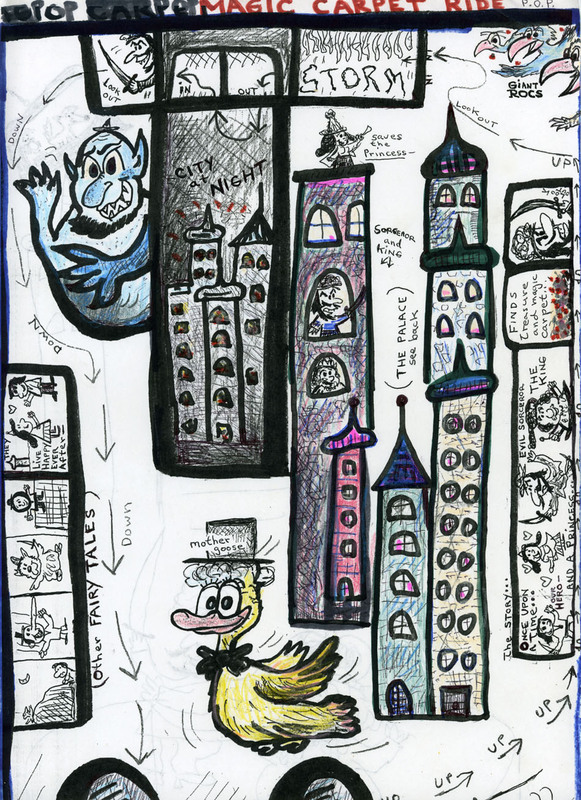 As I showed in my map you slowly went up and were told the story on a tape;"Once upon a time..." There was a nice city scene with the King, the evil wizard and the princess. 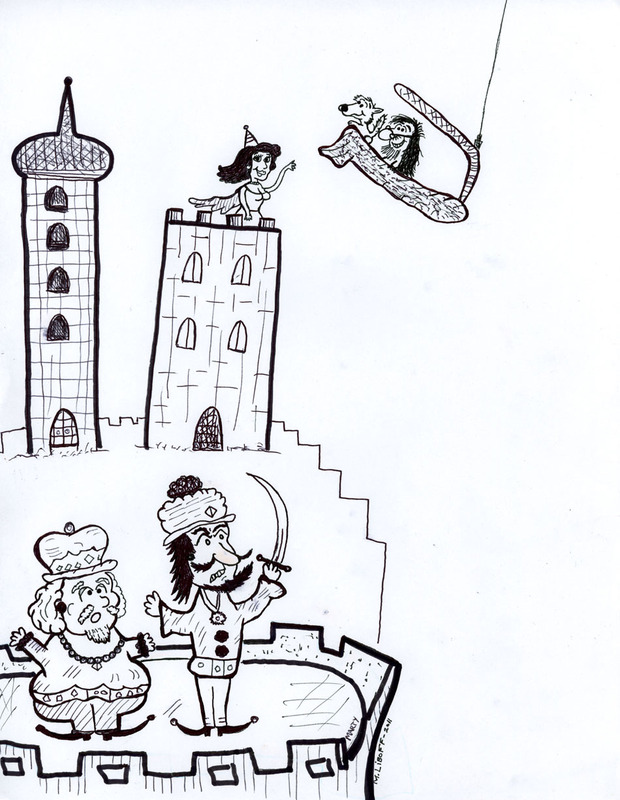 Your flying carpet just makes it over the top of one building and then you flew close to the princess to save her. Then you turned and went up to the top where there were hungry rocs. You turned and went through a couple banging doors into a storm room with wind and lightening and then out to see the city at night. You escape a giant swinging genie whose big arm tries to grab you. Then you go down and there are little dioramas showing the princess and you will live "happily ever after"... Then another door bangs open and there were little dioramas of other fairy tales like the big bad wolf and 3 pigs. Finally a large swinging model of mother goose and then you were out. Most of the moving things and flashing lights were broken when I worked there. Magic Carpet Ride - Detail of princess atop the tower at the top of the ride. 1.Mr Dolphin; Was a giant steel skeleton ride with long steal arms. It had been there from early years on the Ocean Park pier and the old rocket cars from my youth were made up to look like dolphins or flying fish. It was a thrill when it fully extended and you could see for miles. 2.Mr.Octopus; Also had been a ride in old O.P. them they put a silly Octopus head on, but was still fun. 3.The Chick or chickens? On Jeff's map he has rock o plane, but I remember there was a small Ferris wheel we called the chickens because there were cars with chicken heads? It was really scary! Each car had a wheel in the center and if you pulled it all the way one way you would spin upside down! Yow, the large Ferris wheel was just a Ferris wheel, but this was too much, especially after a cotton candy and stall pizza! You could control your spinning if you didn't want to go upside down much or just push all the way and twirl around and around! 4. Another old ride that was revamped for POP was the Sea Shells. Also not in Jeff's map but in his photo on page 247. It had been plain cars and then transformed into sea shells. 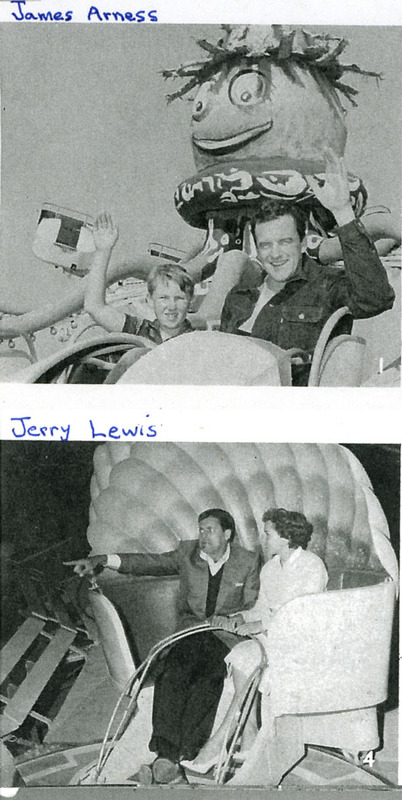 I gave a real cool little photo to Jeff of Jerry Lewis and wife riding in this ride. Its one of my favorite shots and you might like to include it along with several other small pictures of stars I gave him from my brother's school album. 5.Safari ride; Strictly for the tiny tots. Was very cheaply made. You drove through a bad jungle with a rifle that did nothing. It could have been fantastic if the gun was like a shooting gallery and you could actually shoot the poorly made animals. But it was a waste. 6.Sea Tubs; Had a fantastic front, see Jeff 255, with the octopus with cool glowing eyes, but the ride was a dud. You got into a big wood looking barrel and was shot out into a canal of water. That was cool, but from there on you just floated around in semi dark with nothing much happening even when the ride first opened and everything worked! You were led to believe you were going to hit a big ship and other things but it was done cheaply. I think now that they thought this would be like a tunnel of love, slow, semi dark and cozy? However, for me and my buddies at 9 years old we were highly disappointed. After a couple years they didn't change the water and it began to stink inside. Then they should have called it the Smelly Sewer ride! 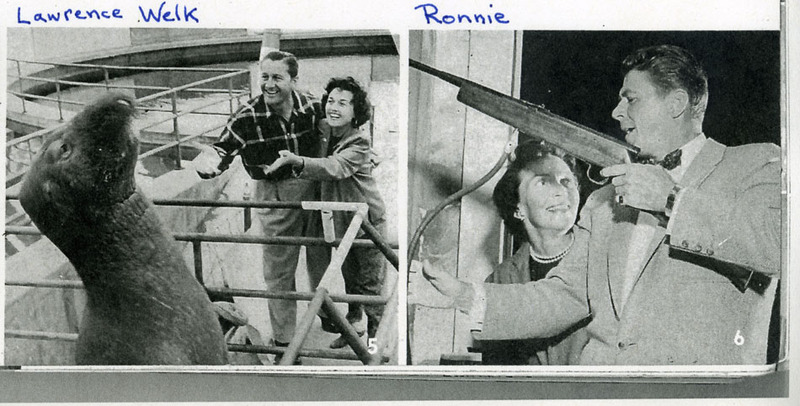 7.The Whirlpool was another old ride just renamed and painted for POP. It was a rotor ride where the floor drop out, Jeff page 260. It was next to the Mirror Maze that I worked on. Thinking back now it may be that some people wouldn't go into the mirrors because that damn Whirlpool was next door. It was the number 1 vomit ride! There was always piles of vomit around it and it stunk! Most people threw up outside, but some people would sometimes vomit even on the ride and it would stick to the bottom and sometimes sides of the rotor wheel! Dear Chris, Been kind of busy here. Yes, I remember quite a lot. I lived less than a block away and my mom ran a bakery almost in front of the entrance. I also worked there. 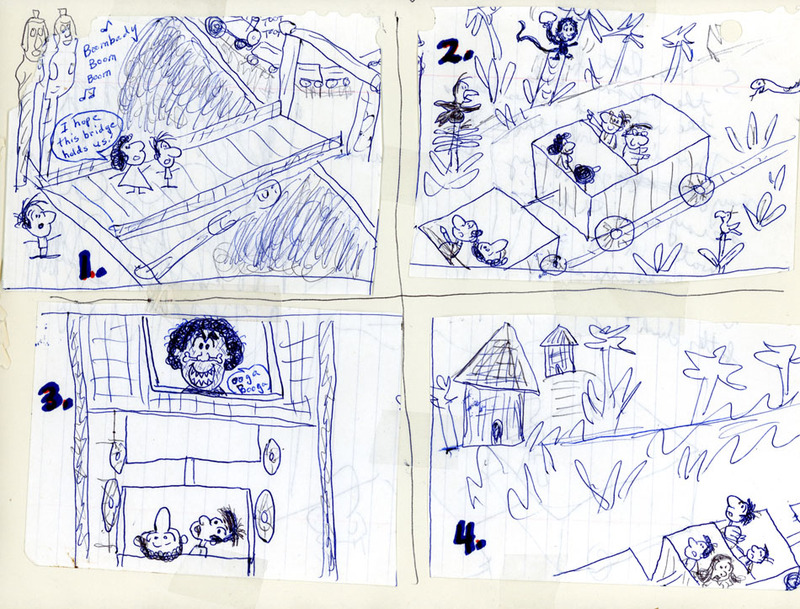 I especially remember the rides I worked on the car ride; sky ride, glass house, diving bell and magic carpet ride. However, I was there so much that I remember many of the rest of the rides and got to see things that visitors never saw like the mechanic shop, offices, and the Dome Theater which became a storage and food dropoff. If I have time I can go through the entire park. I might as well begin from the beginning before getting to the Fun Forest. The main entrance was spectacular when it opened. I don't need to tell you much about it since you can see it in some films and photos. However, Jeff wasn't aware that the water in the entrance pools had color lights and music that would flash different colors and seem to synchronize with the music. The front of the old Santa Monica auditorium became a backdrop with giant sea shells and water falling down. It was really beautiful when it opened. As time went by the lights, music and waterfalls broke down, but even then it we pretty cool. Then we were ushered up and out by the Westinghouse building which was the old S.M. Auditorium. Before entering we were greeted by a large robot, that Jeff thinks was from the 1939 World’s Fair? He explained what was inside and talked about the future and was very entertaining. Then the doors opened and we were led into the large old auditorium. They left the old beautiful wood floors that once had dancing and shows when I was small there and Westinghouse put up their displays of the future that they thought would be. New engines and other modern stuff. They had some games with cute girls leading us for kids. There was a replica of the Nautilus and displays of atomic energy and how it works since the Nautilus was atomic powered and built by Westinghouse. Again though, by the time I worked there much of it wasn't working anymore. After this you walked into the main park. To your right was the Sea Circus. Again, I think there are some films of some of the show so I won't go into it too much, but it was a fantastic show when it opened. I had been to Marineland and later Sea world and this show was as good or better even without lots of giant whales. They had one whale who did a couple tricks and an elephant seal that did a couple cute tricks. There was a chimp who performed and did a high dive. Mostly there was a seal act and the performing dolphins. This was a first class show. The first time you were in the park you could see the Fun Forest and went there to check it out because of the giant artificial trees. Most of us older kids were disappointed to find little kiddie rides. There were rides for very small kids like a little helicopter and cars etc. There was a large tree house maze that even bigger kids liked because it was fun to play chase and hide and seek inside. We didn't like the tiny babies and mom's there because they just got in our way when we would play chase. Nearby was the seal tank, diving bell, Ferris wheel and a spin and tilt ride. I told you about the diving bell, but the main rides I worked on were the Union 76 car ride and the Skyway bubbles. The Union 76 car ride was a blast, although it was usually boring working there except when would start the cars up in the morning and ride around. The cars were similar to the ones at Disneyland, except there was no middle track like Disneyland had so you could actually bump the sides of the road. If you floored it a one point you could actually get a pretty good jolt by crashing into the side or banging into the car in front. Originally there were two working tracks next to each other. When I worked there the inside track was only for us workers to get cars started since some of the sides were cracked and broke. I almost hurt myself pretty good one morning trying to get a cranky car running and didn't notice the broken piece of concrete sticking out and smashed into it almost flying off the pier! There were two styles of car bodies, an old fashioned look and a more modern car. I think the engines may have been Briggs-Stratton gas engines Just south of the ride there was the mechanic shop who fixed the cars and later he was supposed to try and fix other rides but he usually couldn't. Next to the cars was the Skyway. It was just like the one in Disneyland except much, much higher and went over the ocean. The cars looked like bubbles and you could see for miles and look over the whole park. It was quite scary at times, especially at the highest point in the middle when you though your bubble might just fall off down into the deep ocean below! There were rumors that one bubble fell off with people inside, but I don't believe it was true? I doubt anyone would survive the drop. I worked on the scary side of the ride in a small wood hut at the top of Mystery Island's mountain. The bubble would turn around and return there and me and another idiot would grab the bubbles and push them around to go back. This was a very dangerous place to be, and cold and windy some days and lonely. The guy I worked with threatened me with a big Bowie knife when I started telling me that if I screwed up they would never find my body way out there in the ocean! Yow, why did I still stay there for all of $1.50 an hour! Luckily the boss transferred me over to the diving bell and later the glass house after a few weeks up there. The passage to the other side of the park was around the roller coaster by the Flight to Mars. The roller coaster or Sea Serpent was the same as it had been for the old Ocean Park pier except they added serpent heads in front. It was a great old wood coaster. We used to go to New Pike in Long Beach on their old roller coaster and although I think the New Pike coaster may have been longer I think the first fall at P.O.P may have been steeper. There is quite a lot of it in a movie I gave Jeff with Paul Revere and the Raiders band riding it. 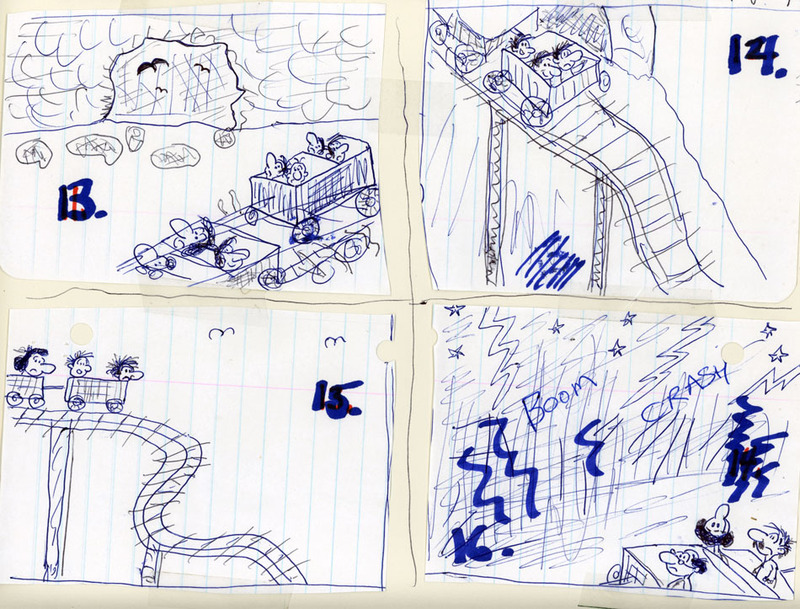 I made a little sketch of the Flight to Mars ride and a nice drawing of the Magic Carpet ride that I gave Jeff that I hope he sent you? I can explain it more if you'd like. The Flight to Mars was really cool when it opened, but later it became a joke as stuff inside broke down and wasn't fixed. Originally there was the boarding room with cute signs advertising stuff on Mars. Then you entered a flying saucer where you blasted off and were shook around. Then there was a moving sidewalk that showed dioramas of Mars with Martians and their life. Then there was a Mars room and finally you were whisked back to earth in a transporter room with black lights and strobes. Hi Marty - How are things? I'm just working away here. I plugged in some of your descriptions and information you've shared into my working document - what a great memory you have! Most folks are not so specific in their memories. I was born too late to go to P.O.P., so I appreciate the first hand accounts. Thought you could mention the outside boardwalk shops? I feel like I'm writing your book! Did you ever go to POP? Before POP, there were many shops outside on both the west and east side of the boardwalk. There were several old hotels and apartments that had once been hotels. Most of them had been built in the 1920s. When they built POP, POP took over the west side of the boardwalk and replaced the old shops with new ones. Before POP there were two old movie houses on the west side; the Dome and Rosemary. Both of them were closed by POP. The west POP side built all new shops with very cool fronts. There was a grand beautiful Chinese restaurant and bar. The famous old actor Leo Carrillo had a fancy Mexican restaurant and bar that he entertained some of his old movie buddies in that he called Carrillo's. I met him a couple times inside his restaurant, when I was a kid. He was an old hero of mine as a child since he was Pauncho in the Cisco Kid TV show. He would show up in a limo and all dressed in the most fancy Mexican clothes and sombrero. There was also a very nice ice cream shop; a cool Sea Shell and souvenir shop; a souvenir shop selling POP postcards and plates and other POP stuff. There was a very good Swedish restaurant that wasn't real expensive. These new restaurants were too expensive for us since we were very poor. POP also ran the little shop in the middle of the boardwalk that had once been privately owned little stands. There were two little soda stands with hot dog and popcorn and cotton candy and another souvenir shop. Ran into an old buddy today who worked at POP in 1967 its last year. He worked also on the Skyride, but on the entrance side not the horrible mountain side. He remembers the boss's real name was Don Costa (D Acost ya). He said he could write some memories of the park. He didn't save any photos and doesn’t seem to remember some of the rides as well as I do. 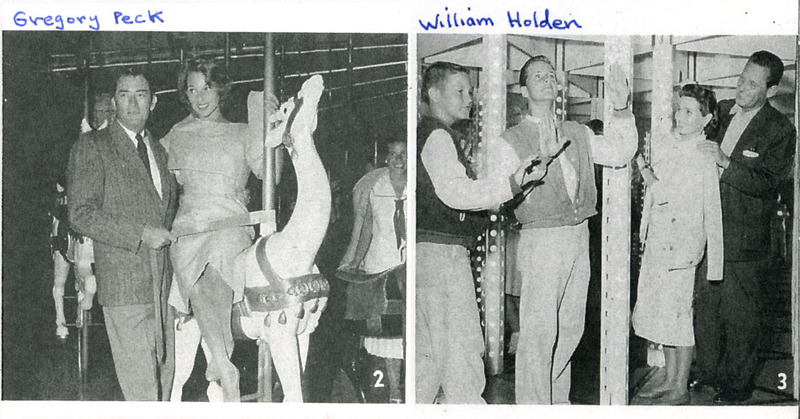 He fondly remembers the Cheetah Club. This was the Aragon Ballroom on the south side of the pier that later was named the Cheetah Club during the hippie days. In the 40-60s ,Dorsey and later Spade Cooley and then Lawrence Welk used to play at the Aragon. Spade also used to play on the Santa Monica pier. Spade and Welk were on early TV at the Aragon. I gave Jeffrey a great movie of Welk's show with many great scenes on POP. I hope he sent you a copy? When it became the Cheetah, all the big bands of the 60s-70s played there, like the Jefferson Airplane, Zappa, Doors, etc. After it closed, they filmed They Shoot Horses Don't They, with Jane Fonda inside. After the Cheetah closed there was another rock club along the POP outside promenade, but I don't remember its name? I hope you also include some stuff about the previous Ocean Park pier.? Many of the POP rides were the same rides as the O.P.Pier, but just revamped The giant rocket ride became the Flying Fish; the roller coaster became the Sea Serpent; the spinning chairs became sea shells. The original diving bell was much better on the old pier when it was next to the rocket (Flying Fish) since I believe the water was actually filtered with ocean water that kept the fish alive. When they moved the diving bell for POP, all the fish inside soon died. When I was there I would tell customers that the popcorn boxes and soda cups in the diving bell tank were rare fish! "Off to you left there is a rare man eating soda cup fish!" The other reasons for POP failing were as I said before a lack of desire to spend any money keeping up the rides. Rides would break or things in the rides would break and never be fixed. Pretty soon some of the rides had nothing working inside! For example, the space ship and most of the displays in the Fight to Mars didn't work and you would just walk through seeing almost nothing! It was sad being there after seeing it in its glory when it opened. people who had gone there a few times didn't return since how many times could you ride the roller coaster or go on a broken down Mystery Island ride? They didn't keep revamping the park to attract people who had already been there a few times. If they had kept up the rides and added new ones then people might have gone back. It seemed that the manager didn’t want to spend money on fixing anything or buying any new rides. Looking back, if they had left old Ocean Park and not created a giant bombed out mess, and kept up the park it might have continued. They could have had added entertainment like music. I would have sold off the park to individuals who would own a ride or concession like it was on the old Ocean Park Pier. That way each owner would have a personal desire to keep his ride or concessions up. The corporate ownership of the entire pier made it so there was no priority to keep any particular ride or concession going. When the diving bell finally quit working, my boss told me to stand out in front and tell customers that it would be open soon. Of course when he heard how much the parts cost to fix it, it never reopened. On many days during the week it became like working in a ghost town at POP. A few times when I was working at the mirror maze, the boss drove up in his electric cart around lunch time and asked me how many people had gone in and I told him none! He then would send me over to work on something else and just have me close up...That winter, he decided to only open on Thursday-Sunday. Then it was Friday-Sunday. Then he began reducing the hours...He would drive around and yell at you if you weren't at least acting like you were busy. It was a real difficult thing to keep up the appearance of interest standing around doing nothing but waiting for a customer! On busy days it could be a lot of work, but the time would go by fast and it was fun to talk to all the customers. On the dead days, it was like doing Buddhist meditation just to keep looking awake! Do the sound effects have any of the dialogue or story lines? For example; The Magic Carpet ride as you flew on the carpet they told you the story of how he got the carpet and won the princess and rescued her from the evil sorcerer... I gave a copy of the Lawrence Welk show filmed around P.O.P to Jeff a couple years ago that has some great scenes. I was there as a child when Skipper Frank and I believe Tom Hatten filmed their local cartoon shows there for a week...I got their autographs then and I may have been on the show in the background? I don't know if any of that still exists? I hope you include a little background with some shots of the old Ocean Park pier? I may have been one of the last people to see and go into the old Dome Theater. It was unfortunately only used as storage at P.O.P. It had been one of the old grand movie houses 90 years ago... I would go there to get popcorn ad napkins and stuff to deliver with an electric cart to the food shops. It was the only kind of fun job since I had a little freedom to hop around the park. One thing I would like to see is some photos a block north of the pier. I lived on Raymond Avenue. there and my mom managed an old Jewish bakery on the front there. It was torn down not long after P.O.P. was opened. I have plenty of photos of my block, but none of the bakery there except for a couple from the distance... To many of us old timers, much of the problems began when they started the redevelopment project and began tearing down old Ocean Park. It slowly began to look like a blown up war zone. The locals were displaced. Soon it literally looked like a scene from Hiroshima. This continued for years until the Shores Apartments were finished. All the locals like ourselves had patronized the piers and businesses on the front. Pier Avenue. had been a major business street going back to around 1900s, and they tore it down also and finally they got rid of all the wonderful old shops on the boardwalk in front of P.O.P... I have a few photos inside the park, but the quality is not great. One shot of the seal tank, a couple from the top of the Ferris wheel, a couple of the Sea Circus with one of the diving monkey atop his pole. I also have a couple shots somewhere of the demolition of O.P. Anyway, all for now... Marty . By the way, you may be interested to know that we have found copies of the tapes of the P.O.P. sound effects. The plan right know is to have a CD available included in the book. I'd send you a copy - but we have been under strict orders not to do so under we work out a deal with the folks who "own" the tapes. I say "own" because really, they don't own them - no one owns anything from P.O.P. any more as the companies involved all went bankrupt. But they want to release the sound effects as a limited 12" record first, then as a CD included in our book. Some sort of financial arrangement has to be worked out with them before we do this.